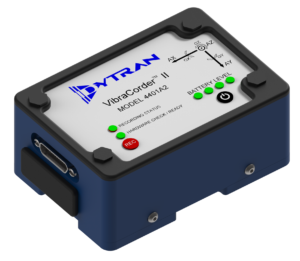 Dytran has introduced the VibraCorder™ II, a small, yet powerful, 6DOF vibration recorder. Model 4401A2 not only has a built-in triaxial MEMS accelerometer, but also a triaxial Gyroscope, making it capable of measuring and recording acceleration and orientation in three orthogonal directions as well as pitch, roll and yaw. These units include easily installed, user-configurable, software that optimizes data collection while built-in firmware handles acceleration in three axes as well as gyroscope data on the removable Micro SD-card. Features of the VibraCorder™ II include multiple recording regimes (free run, triggered event, triggered free run, auto stop, etc. ); several sampling rates available up to 4280 Hz; environmentally sealed with IP65 rating; mounted via mounting plate and screws; rechargeable LiPo battery or external power from 8-32 VDC; software controlled relay for the operation of external components such as cameras, indicator lights, and other accessories; multi-day recording capabilities; low battery indicator with emergency file save feature. The 4401A2 has a ±16g range, but there will be two other ranges, ±5g and ±200g, available soon. The VibraCorder™ II can operate in a variety of application environments, including automotive vibration testing, remote vibration measurement, rotating machinery diagnostics, impact testing, and recreational vehicles.